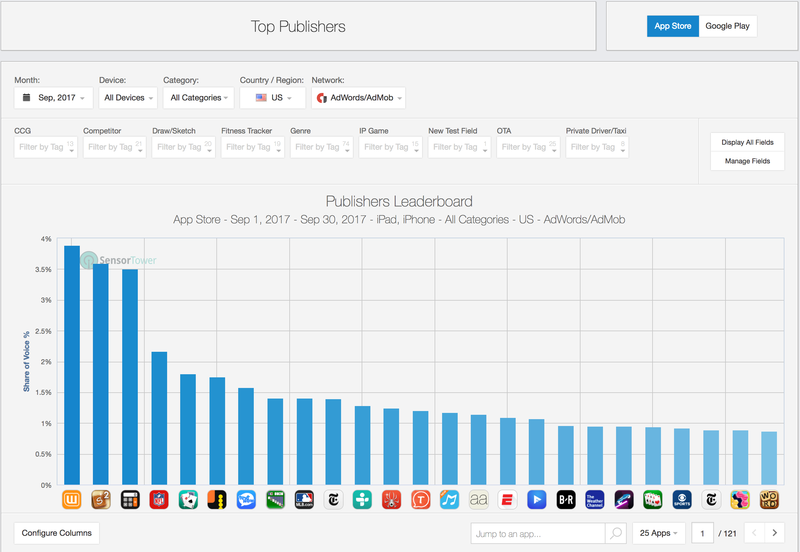 With the Top Publishers feature, you can view who the top ad publishers in any country, across the largest ad networks, for any date range, and in any app category. This tool provides you with the top ad publishers by Share of Voice (SOV), given your selected country, ad networks, date range, and app category. As with other features, you can define and filter this list by Global Fields to further refine your cohort of top publishers. Filter publishers with Custom Fields, ranging from revenue and download estimates, app genre, and soft launch status. Filtering will help you dig deeper into the trends or cohorts of publishers that you care about the most. Below the SOV ranking graph is a ranked list of the top publishers on a given network, along with additional details for each publisher for the selected time period. By default, you will see the SOV for the current time period selected, the SOV for the preceding period, SOV growth, and growth percentage for the publishers on the list. Similar to the Top Advertisers feature, you can configure the displayed columns on the Top Publishers page to display additional information you are interested in by selecting Columns: Default.